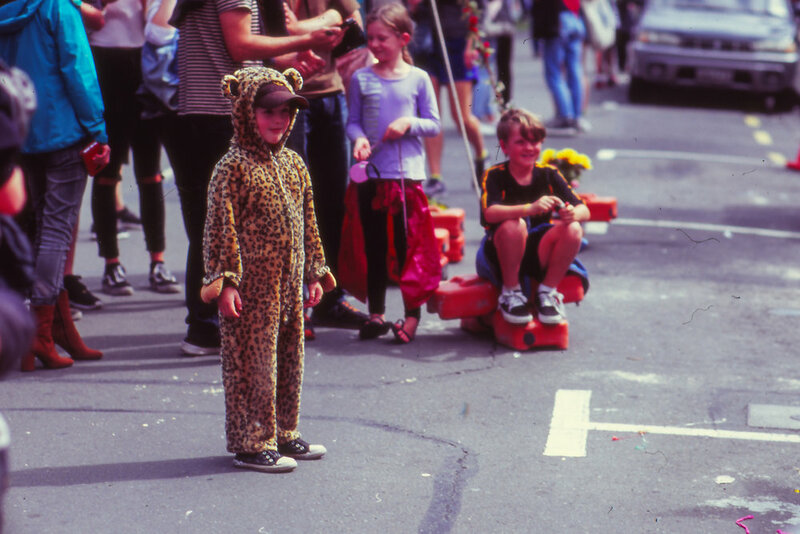 Cubadupa is a festival that happens in Wellington, New Zealand, every March. It takes place on Cuba street, the creative hub of the central city. Good record stores, bookshops, cafes, restaurants and second-hand shops are all found in this area. It is the best part of the inner city. 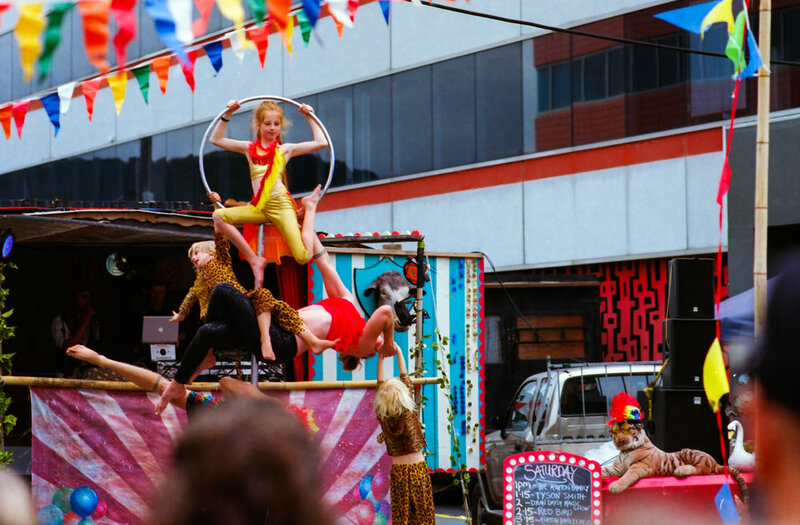 Similar to the Newtown Festival, which happens a few weeks earlier (and I wrote about here), Cubadupa has a carnivalesque vibe to it. There are gypsy caravans, steam-punks, brass bands and all manner of theatrical performances and happenings. 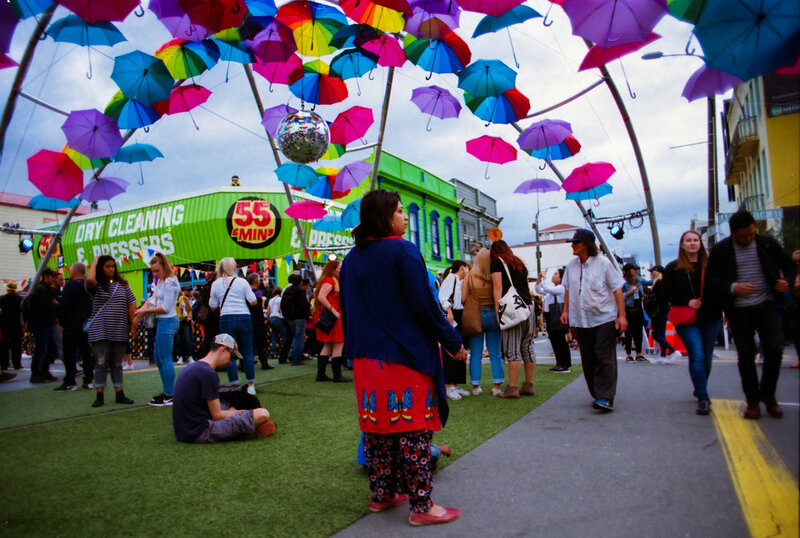 Where the Newtown Festival tends to have a lot of bands - especially indie and alternative acts - Cubadupa is a little more ethnically and culturally diverse in musical styles. That said, it does have a fair share of good bands as well. 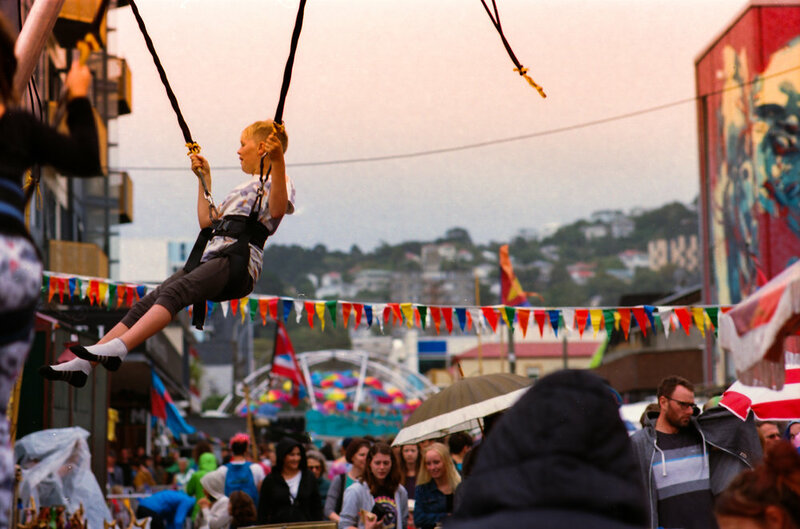 Cubadupa happens over a two day weekend. On Saturday it goes late into the evening. Unfortunately this year it was a bit wet rainy - although the party seemed to continue regardless. I spent the afternoon on Saturday taking photos until the wet drove me home. I took along my Nikon FE2 35mm film camera. With me I had two new (to me, but purchased second hand) lens’ I was keen to try out. The first was the very nice Nikkor 85mm f1.4 manual lens, and the second was a Nikkor 24mm f2 lens. On the first try, both were nice to use. When the 85mm arrived in the post, it was a bit larger than I expected, so it was a little and unlikely to be a good travel lens. The 24mm had had the f-stop ring de-clicked for silent use with film cameras. I found this a little bit disconcerting, to begin with - and it would drift a little - but I got used to it. This was the first time I’d used both of these lenses’. No doubt I’ll be taking more photos with them. I was also trying out some Fuji Velvia 100 slide/positive film for the first time. It was a bit challenging to get the exposure right as it requires real precision, but has an excellent quality to it. That said, it has expired a couple of months ago so that may have been one issue. I will try it again sometime soon. The rest of the photos I shot with Kodak Ektar 100.